A coming of age story, but with polar bears. 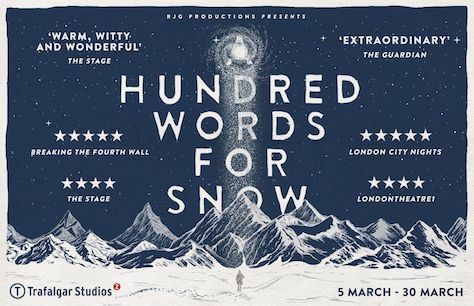 A Hundred Words for Snow, by Tatty Hennessy, has been developed with the support of the Peggy Ramsey Foundation and was a winner of the Heretic Voices Monologue Competition. 5 March - 30 March 2019. Touching and searingly honest. I felt every inch of it. Unbelievably emotional tonight. A perfect combination; a magical script by Tatty Hennessy brought to life by the extraordinary talents of Gemma Barnett and the direction of Lucy Papoosky and her team.